My inspiration this fortnight for FSC’s “travelling” theme is Africa. The original idea for this theme was to represent the journey of mankind and to be transported back through time…. I had so much fun sourcing out the stamps for this. And as much fun as it was, it was a bit of a surprise when they arrived…they were a lot bigger than I imagined. But the idea for the project was in my head so I just had to go with it. So a wall hanging it is!!! Thankyou to my South African neighbours for all their wonderful stories and passion for their country and culture. I really wanted to do justice to your homeland. Thankyou to the South African teacher that I have worked with this year who tried to describe what an African sunset looks like when I asked for her advice. Thankyou Cindy Adkins for helping talk me through how to finish it all off, without really knowing what I was doing…and I hope you are enjoying the piece…now it should all make sense to you! And a very special mention to the DT’s at Fashionable Stamping Challenges for their inspiration each and every challenge…there is so much to learn, but by crikey, what a talented group you are to learn from! Pop on over to FSC and see what they have come up with this time around…stunning! and random sentiments from a clear cling set that I have. wow, you create a wonderful piece of art. Your artwork have fantastic details. I love it. Wow, a stunning hanging, it looks so vibrant and alive. Love all the details and stamps you used. hope you and yours have a Happy Christmas and a good New Year. This really is stunning Dot. The amount of depth you've achieved is simply amazing and all the textures look fabulous. Have a lovely Christmas and wishing you all the best for 2012. Truly a remarkable piece of stamped art. So well thought out in the composition to achieve the most stunning result. Wishes to you for a wonderful festive season. Wow, Dot, it's a breathtaking piece, such a wonderful African creation. Love everything on it. Oh this takes my breath away! I so love the stamping and the depth you created with the animals! This is amazing! Have a wonderful Christmas and fabulous "2012." Hugs! What a stunning piece Dot. You have given it so much care and attention which really shines through. I am sure you will give this pride of place in your house. I put it on Twitter too! Super, super piece of work! You might have been going in blind, but you have definitely created a work of art! I really love how your stamping overlaps the different layers. And those stamps really are gorgeous. Fabulous entry into the dimension challenge. So happy you shared it with us this week at Simon Says Stamp and Show. WOW Dot, this is stunning. 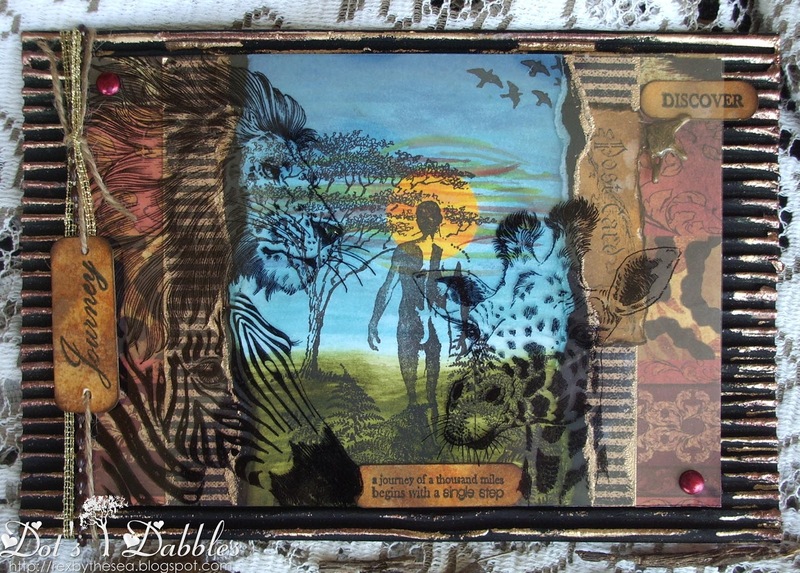 You have created a fabulous background and I love all the layers of stamping, you really have given it depth. I hope you're having a great day~I'm still mesmerized by this piece!!! Loved your work from the beginning Dot it is always so inspiring. Hope your Christmas is still being very festive. FSC is so lucky to have you on the design team your work is always amazing and unique.